Made in San Diego California, the Speedplay X/2 clipless pedals have an avid following of road riders who want a lightweight, elegant, advantage laden solution to their clipless pedal needs. The X/2 set permits a 37¡ lean angle and is double sided permitting entry on either the "top" or "bottom". The pedal body is Computer Numeric Control machined from 7075 T-6 aircraft grade aluminum stock, then hard anodized in a Titanium Grey color. The pedal body is round, 1.7 inches in diameter and .675 inches thick. The pedal body is bored from both ends to create the spindle and bearing cavity. A tenth of an inch from the upper and lower surfaces, a 1/10th inch wide groove is cut around both the front and rear. This groove has some depth at the front and rear of the pedal, with the cut disappearing as it reaches the sides of the pedal body. It is in these cuts that the loaded spring of the cleats grip. With the cleat mounted on the pedal, as the cleat is turned, the pedal lets the cleat release once the rotation reaches the sides of the pedal body. The spindle is made from heat treated Chrome plated Cro-moly steel. Three bearings are housed in the Speedplay interior. 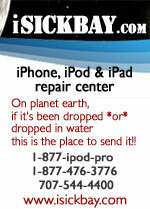 A rubber O-ring seals the inner bearing from outside contamination. The innermost bearing is a 15mm long needle bearing cartridge, made in Germany, marked AB INA HK1015, it has 14 needle bearings to support the load broadly. Two small sealed bearing cartridges are used for the outer bearing assembly. The spindle and the bearing are all held as a unit by a small machine screw, and an expanding lock ring, from the outer spindle end. The outside of the pedal is closed off with a snap-in Black plastic cap. The cleat itself is made of three pieces held together from the bottom of the shoe with four recessed head machine screws. 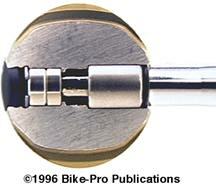 The piece nearest the shoe is an adapter plate to accommodate the hole drilling for the cyclist's shoe. The X/2 pedals come standard with a three hole LOOK and four hole Time compatible adapter plate. The plates to adapt to Nike System Ultra and System TC, or Sidi Genius II shoes are available separately. The remaining two pieces, the upper and lower cleat plates, lie over one another in a perfectly machined fit, housing the two 2.4mm diameter wire springs that grip the cut grooves in the front and rear edges of the pedal body. The adapter plate and the upper cleat plate are made of a polycarbonate plastic. The lower cleat plate, which is most likely to make ground contact is made from machined aluminum plate stock. Speedplay's Magnum ATB pedals are double sided and use a mechanically simple principle that permits rotational release only. The pedal cleat slides over two raised, exposed metal tabs that are part of a copper colored stainless steel barrel that passes through the pedal body. This barrel with tabs at both ends creates the double-sided feature, while its hollow nature permits dirt and mud to drop through the pedal. With sliding pressure, a flexible metal faced tab recesses into the cleat and permits the cleat to lock onto the body. Once in place, the flexible tab moves back up and prevents the cleat sliding forward off the pedal. 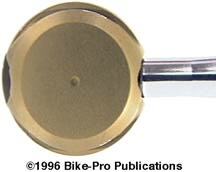 To keep the cleat from sliding merely over and off the pedal, there is a 3.2mm high, raised, copper colored steel post bolted to the rear of the cleat. 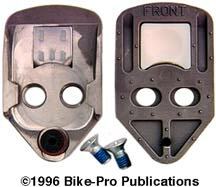 Other pedal types, which rigidly retain the cleat, force a straight line movement of the foot/leg applying stress on the joints. The Magnum is designed to have up to 56 degrees of free rotation before a light vertical tug lifts the cleat away from the pedal. This great degree of rotation minimizes the stress applied to both the ankle and the knee. Looking at a Magnum pedal, you notice that the pedal body appears to be made of a single piece of plastic. In fact it is two molded pieces of "Ultema" composite plastic, in a tan wood grain color, and hollowed where possible to reduce weight. The two shell halves slide down around the stainless steel barrel that has the two cleat retaining tabs. The spindle and bearing assembly, as a single unit, slide into the shell halves and through the steel barrel. A recessed, Phillips head bolt screws from each side into a tapped hole in the opposing shell half. 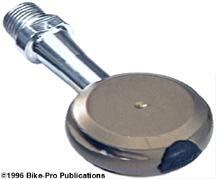 The pedal spindle is made of stainless steel and appears to be the same used in the X/2 and Suntour pedals, but it has a dull nickel rather than bright chrome finish. It uses two small sealed cartridge bearings and a needle bearing cartridge enclosed in an aluminum tube. The aluminum tube is closed off with an aluminum cap at the outer end and has a small O-ring on the inner side, both keep contaminants out. The cleats are made to be SPD compatible, which means they use the same position for the mounting bolts as the SPD cleats. The Magnum pedals come with cleats and cleat mounting bolts. The pair of pedals weighs 269.5 grams. The cleats weigh 96.5 grams and the steel cleat bolts weigh 6 grams, bringing the total weight of the set to 372 grams. The exposed and raised cleat is a clumsy way around more elegant designs that comfortably recess the cleat. Again, Shimano or Ritchey seems to have hit the mark far better and we prefer their micro-cleat implementations. This is a second model of the Magnum pedal with the stainless spindles replaced by machined Titanium 6Al-4V spindles. The color of the "Ultema" composite plastic pieces is Black rather than the "wood grain" tan. This will allow easy identification of the Ti spindled model. All other aspects of the Magnum Ti are the same as the Magnum. Like the X/1 pedals, the Magnum Ti pedals are not recommended for use by riders weighing greater than 175 pounds (80 kilograms). The pair of pedals weighs 225.5 grams. The cleats weigh 96.5 grams and the steel cleat bolts weigh 6 grams, bringing the total weight of the set to 328 grams. Again, Shimano or Ritchey seems to have hit the mark far better and we prefer their micro-cleat implementations.